Ronald Read lived a simple life. He was a lifelong resident of Brattleboro, Vermont, where he worked as an attendant at a gas station owned by his brother. After completing a tour of duty during World War II, he spent the next 25 years working at Haviland’s service station, according to the Brattleboro Reformer. Ronald didn’t need much. He wore old, flannel shirts and still cooked his meals on a wood burning stove. He was known to park a great distance from a destination and walk there to avoid having to shell out a few coins for a parking meter. Once he retired from the service station, he decided that retirement wasn’t to his liking and took a job as a janitor at a local J.C. Penney. He enjoyed a long, well-lived life before passing away in 2014 at the age of 92. But Ronald had been harboring a secret – the hardworking, frugal janitor was actually a multi-millionaire. Upon his death, it was discovered that through multiple well-placed stock purchases, the humble janitor had managed to amass close to $8 million in stock certificates – the majority of which he bequeathed to his local library and hospital. Ronald Read wasn’t a high-earning, six-figure guru on Wall Street with a large disposable income. He was an average, hardworking American who, with the right strategy, was able to grow his modest nest egg into millions of dollars – something that anyone is capable of doing with the right resources. 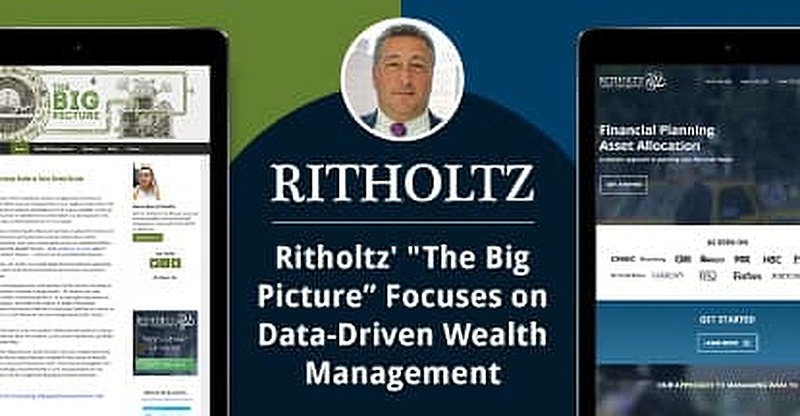 Barry Ritholtz and his team take a long-term approach to wealth management. Barry Ritholtz has dedicated his career to helping people do just that – develop the right strategies to grow wealth over the long-term so that they can have the life that they want. Like Ronald, he understands that growing wealth is not a get-rich-quick scheme – it requires patience and perseverance over the long-term. Through Ritholtz Wealth Management, his financial planning and asset management firm, Barry utilizes data-driven strategies to provide clients with the resources they need to make the most out of their money in the long run so that they can retire on their own terms. Barry Ritholtz didn’t start out seeking a career in Finance. He began college with the intent of pursuing a degree in Mathematics, but close to his senior year he changed course and decided to pursue Law instead. It didn’t take long to realize that practicing law wasn’t for him, so when an opportunity opened up to join an up-and-coming trading shop, he decided to take it. In trading, Barry found his passion and began a lifelong fascination with understanding what factors motivate investors when making financial decisions. Soon, he progressed from trader to analyst, and eventually landed the job of Chief Market Strategist at Maxim Group. In 2003, he began publishing financial advice on his blog, The Big Picture, which can be found at Ritholtz.com. Readers appreciated Barry’s research-based, easy-to-follow advice and he began to gain a strong following. Media requests soon followed, and, to date, Barry has appeared on many high profile networks and shows, including CNBC, Bloomberg, CNN, Fox, PBS, and The Daily Show with Jon Stewart. Barry Ritholtz’s Big Picture blog features articles and analysis of more than just the financial world. In addition to his career as a market strategist, Barry is also a featured columnist at the Washington Post, host of Bloomberg’s “Masters in Business” podcast series, and author of Bailout Nation: How Greed and Easy Money Corrupted Wall Street and Shook the World Economy. In addition, he serves on the advisory boards of two leading technology startups, Riskalyze and Peer Street. In 2013, he decided to put his research on behavioral finance to good use and founded Ritholtz Wealth Management. His company takes a unique approach to wealth management services by utilizing in-house research on behavioral finance in connection with best practices in portfolio management to help clients achieve success. This investment approach enables the team at RWM to capitalize on the long-term without allowing temporary market activity to affect the decision-making process. The program operates on the concept that thinking and acting for the long-term is extremely important to successfully growing wealth. While their overall strategy focuses on growing wealth, they also incorporate a risk management strategy to help clients get through short-term rough patches in the market without needing to change their long-term investment plan. Barry Ritholtz explains the 2008 financial crisis in layman’s terms in his book Bailout Nation. The 2008 financial crisis came as a shock to many, but not for Barry’s followers. He was one of the few strategists who saw the writing on the wall far in advance and issued warnings about the impending market collapse in time for his clients and readers to protect themselves. Shortly after the collapse of the housing market, Barry wrote the book Bailout Nation, which was published by Wiley in 2009. Bailout Nation soon gained acclaim for taking a complicated subject – the 2008 financial crisis and subsequent government bailouts – and breaking it down into simple layman’s terms. The book offers a clear and concise look at the financial lenders, regulators, and politicians responsible for the financial crisis. It also outlines the impact that each government bailout throughout modern history has had on the American economy. Bailout Nation is precise and straight to the point, even calling out those responsible for the 2008 crisis by name and outlining what role they played in the economic downturn. Bailout Nation has received praise from many media outlets, with the New York Times pronouncing it as “Irreverent”. It was named as Stock Trader’s Almanac’s 2010 Best Book of the Year and Wall Street Cheat Sheet awarded it their 2009 “First Amendment Award for Outstanding Journalism”. Since 2003, Barry has been publishing regularly on his popular financial blog, The Big Picture. The leading financial blog generates several million page views per month and covers everything from investing and trading to macroeconomics. At The Big Picture, Barry provides advice and insights into the complex world of investing in terms that are easy for novice or would-be investors to understand. On his blog, Barry approaches the world of finance with matter-of-fact observations and a quick wit that resonate with beginners and seasoned investors alike. On The Big Picture, readers have access to a wide range of posts covering everything from market analysis and breaking financial news to politics and the latest episode of Saturday Night Live. The Big Picture has received countless media accolades, with TED including it in its list of “100 Websites You Should Know and Use” and the New York Times magazine featuring it in their 10th annual “Year in Ideas”. The secret that allowed Ronald Read to amass millions of dollars during his lifetime while earning a modest income? According to an article that Barry wrote about Read for the Washington Post, it was patience. Barry wrote that when most investors lack patience, they start saving too late in life and then become impatient about slow returns. He also noted that Read held a diversified portfolio, purchasing stock in a broad range of industries, which helped him weather violent market activities. He avoided jumping on the bandwagon and investing in technology and the hot stocks of the day, but rather invested in blue chip companies – those that sell nationally recognized and widely accepted products and services to consumers, such as Johnson & Johnson and Proctor & Gamble. The strategy used by Ronald Read to amass his fortune is not one that comes naturally to most people. According to Ritholtz, our own brain is the source of almost all of our investing errors. When making investment decisions, people tend to fall prey to things like the Recency Effect – focusing on markets that have seen recent success rather than analyzing data over the long run, or Groupthink – a tendency to go with the consensus without conducting any independent research. The issue of human emotions having a negative impact on investment decisions is why Barry utilizes data-driven investment strategies for his clients. He recognizes that acting on emotions can lead to constant changes being made to investors’ portfolios based on the ever-changing trends in the market. That’s why he and his team at Ritholtz Wealth Management have developed a set of guidelines designed to give their clients a higher success rate over the long-term compared to those who make investment decisions based on recent market trends — and fear. “We believe that thinking and acting for the long-term is paramount,” Barry writes on Ritholtz.com. “This idea is at the heart of our client service and portfolio management program”.